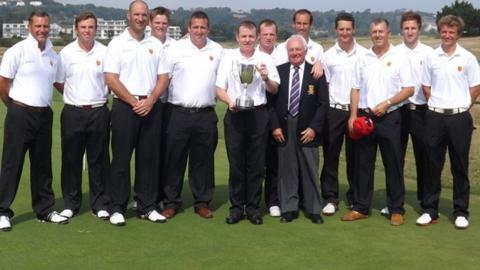 Jersey's golfers have cantered to a comfortable 13-7 win in the annual Challenge Trophy against Guernsey at the Royal Jersey in Grouville. The home side raced into a 5-0 lead after the foursomes, and were 8-2 in front overnight. Sunday's singles were halved after debutant Dan Scriven birdied the last to square his match with David Jeffrey. "It was a fantastic finish from him," Jersey captain Steven Bowen told BBC Radio Jersey. "It would have taken the edge off it slightly if we had lost the singles." Bowen has been team captain for six years and was particularly pleased with the start they made against their Channel Islands rivals. "It was as dominating as I've ever seen us be and the Jersey team really came out of the blocks and played superbly well. "It really put us in a position where we were going to struggle to lose from there. "We ended up winning 5-0 in the foursomes and I'm not sure we would have even hoped for that in our wildest dreams. "Notoriously we're slow starters, it was pretty special."